With the Yankees and Red Sox ready to square off in their second series tomorrow, 30 Rock’s Alec Baldwin and The Office’s John Krasinski keep the Yankees-Red Sox rivalry going with a new spot for New Era titled “One Hitter” which will debut tomorrow during the opening game of the series. Check it out. It has to be one of the best commercials I’ve seen in a long time. The commercial is set to air throughout the season during Yankees/Red Sox games on: ESPN, FOX, the YES Network and NESN. They will also be shown on the following cable channels: Comedy Central, Adult Swim, Spike, FX and SNY. “If he really wants to impress us then he can get the Rangers off of welfare and show how they can be revenue-sharing payers, rather than recipients for three years in row, without financing from Major League Baseball,” Levine said Friday. ZellsPinstripeBlog.com has reached a major milestone. Just recently, the site reached the 500,000 hits milestone and I think it’s a good reason to celebrate. I started this blog back in March of 2008 thinking it would just be a hobby, but it’s turned into much more than that. When I first started this blog, it was a struggle to just get a few hits per day on this site. Now, we have a forum, a great team of writers, and loyal readers. It just shows you how much this site has grown since then. I’ve gotten to know new people, learn knew things about the team and realize how great the Yankees fanbase really is. I just want to thank all of you for making this possible. Freddy “Sez”, a Yankee Stadium staple for the last 20 years, has died at age 82, according to friend Chuck Frantz. 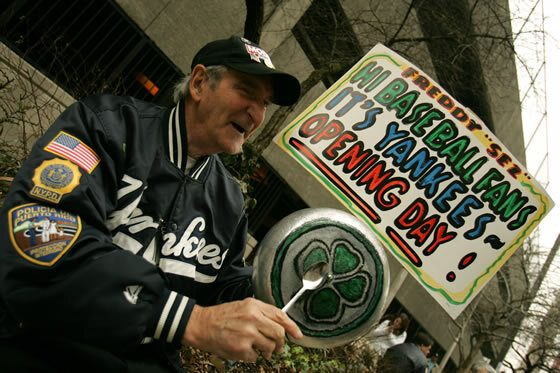 At almost every Yankee game, Freddy could be seen outside Yankee Stadium with his daily message for the Yanks and a frying pan he banged like a drum. He also let other fans bang it as well. He became such an institution that his lucky frying pan and spoon, thanks to Frantz, were put into the National Baseball Hall of Fame and Yogi Berra museum in 2004. Freddy was also a big fan of the Manhattan and Fordham sports programs. Update: According to several other reports, Freddy was 85 years old…not 82. The girls are getting rowdy in the Yankee Stadium Bleachers…Cat Fight! From ESPN: PGSS correspondent Zack Robidas conducts an experiment using two Yankees fanatics, the cousins Anthony, to help Boston fans better prepare for a visit this weekend to Yankee Stadium.